I’m sure most people reading this would think this was a strange angle to tackle on the whole Baby Gammy controversy. After all, why would Ms. Pattaramon (Goy) need defending – she’s been described as a “saint” and an “absolute hero” by Scott Morrison, the Australian Immigration Minister himself, right? I’ve been following this story quite closely for obvious and not-so-obvious reasons – the parallels in our situations – Down Syndrome baby, AVSD (at least until the latest prognosis that says Gammy does not in fact have a life-threatening heart condition), the family’s street food stall, even photos of Goy and Gammy contrasting her brown skin against his alabaster white complexion, which evoke a sense of familiarity with some of the shots of Noah and me. Yet, as the story continues to play out in the media, I’ve noticed that support for her is not as monolithic as it appears. I’ve seen some rumblings about her motives in keeping the baby – insinuations that she’s using him to cash in, headlines that she told the agent she would keep “the dumb baby” (which had the effect of stirring the ire of the politically correct demographic), revelations that once she took on the surrogacy arrangement she moved up in the world from ramshackle hut to not-quite-so ramshackle unit and even had a bit of a spending splurge on nice handbags and clothes or whatever. I could go on. She’s now hiding from the media thanks to the backlash. That’s a shame. She doesn’t deserve that. Goy kept the baby, she didn’t choose to abort him. She did so despite her own financial circumstances, and despite the fact she’s not the biological mother. She did all this for 6 months BEFORE the international media got hold of the story and money started coming in through donations. I want to relay a story from a successful Chinese businesswoman I know. She saw that I was bringing Noah with me to trade at my food stalls, and she said she admired my strength. She then revealed her own past to me. I have to admit in my elementary Cantonese and her not-perfect English (we communicate in a mixture of both) I never fully grasped the medical issues involved in her story. She told me that once upon a time, before her now-grown up children came along, she gave birth to a baby in China. The doctors pulled her aside and said that based on their medical opinion, the baby had a 90% chance of developing a debilitating brain defect. They told her she had 2 options – to accept the baby and surrender to a life of dealing with his condition – or to leave him behind at the hospital and go home. She chose the latter. I don’t know what happened to the baby – whether he automatically became a ward of the state, or whether he died, or whether she was in fact scammed by rich people who wanted a child of their own. Ironically she relayed the story to me to show that she and I had something in common beyond the fact we’re both immigrant Asian businesswomen – the fact that she walked away and got on with her life was a display of the same kind of strength she sees in me. Siblings say the darndest things, don’t they? 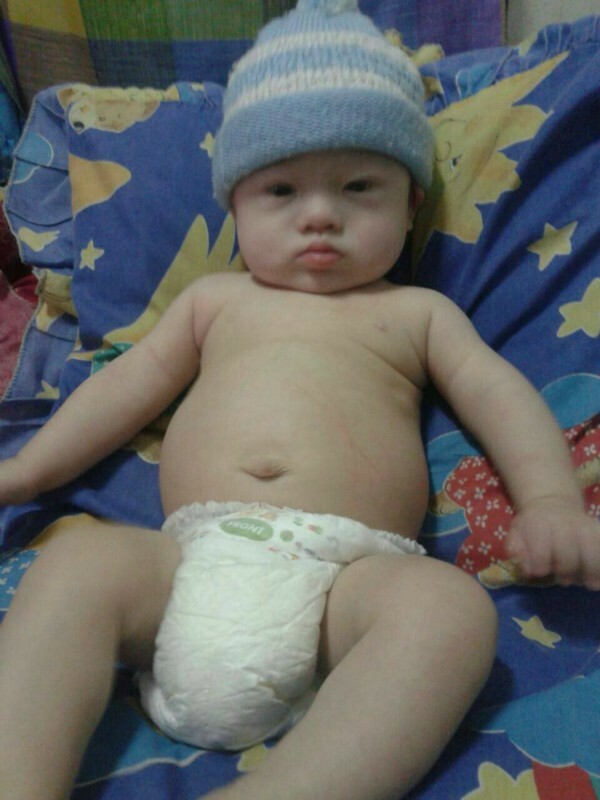 😉 Oh and also, anyone who accuses me of sharing Noah for any reason other than to show that life can be a blessing even if you have a Down Syndrome baby – can go to hell. You can see why I’m irked by any kind of negative second-guessing about Goy’s motives – I experience it myself. “There’s something wise and maybe….right about accepting your lot in life”. 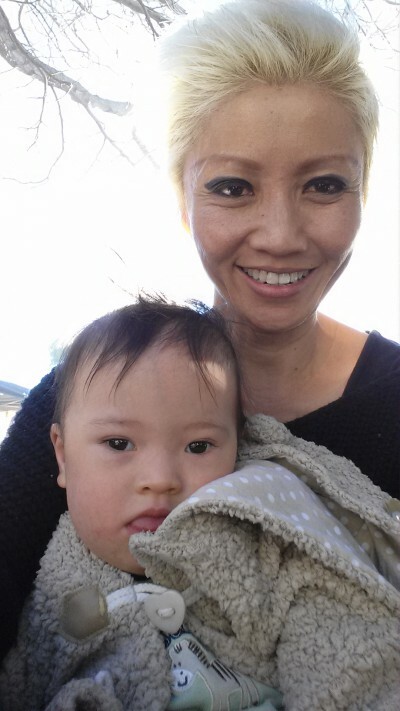 I’m not disputing it was hard for my Chinese businesswoman friend to abandon her baby, but that Goy chose to take care of Gammy despite everything, I think, deserves our admiration, not scorn. Baby Noah and me at the Markets. Great piece as always Jackie. I am trying so hard to be non-judgmental esp in the Gammy case, however I can’t help myself and comment about the Chinese Business woman’s comment. I think the only thing you have in common is the fact you are both migrant businesswomen. Again I don’t want to make a judgement on her decision but comparing her decision to yours in terms of identical ‘strengths’ has me flummoxed. Perhaps seeing how you advocate and care for Noah can be unsettling for some people who have chosen differently or know they could never cope.